We have some new woven cottons from designer Anna Maria Horner. Take a look! Anna Maria has been known for her outstanding cotton prints, but in this new collection, Loominous, she is shifting to woven patterns. Soft checks and plaid blend with textures, stripes, and subtly metallic windowpane. Perfect for shirts, blouses, dresses, skirts, even pajamas. Anywhere a soft, understated cotton is desired. Check out this sweet apron - with a little edge. This pink kitchen print's motifs are rendered in classic tattoo style, keeping this apron from becoming overly sweet. The perfect blend of charming and cool. Plus, these cooking puns are pretty irresistible, aren't they? This apron was made using McCall's 5720, which includes both adult and child sizing and lots of options for your perfect apron. It's about more than just keeping your clothes clean, you can make an apron an accessory, too! We have some airy light new cotton prints on lawn and voile, perfect for whispery soft blouses and floaty dresses. Our Memorial Weekend Sale continues! All fabrics are 20% off, Friday, Saturday, and Sunday! We will be closed Monday. Our long Memorial Day weekend is almost upon us, and it looks like we may have some rain in the weather forecast. This presents the perfect opportunity to spend some time indoors working on a creative sewing project. 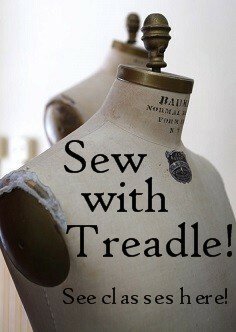 To sweeten the deal, Treadle is offering 20% off on all fabrics this Friday, Saturday and Sunday. Just remember, we will be closed on Monday, May 25, Memorial Day. We have a beautiful selection of summer fabrics and great ideas for your next project. Please stop by and let us tempt you! We have the new Burda Style summer special kids' issue available at Treadle! Each issue of Burda magazine is packed with fresh ideas for garment sewing. And ALL the patterns are right there in the magazine, full-size. Just trace and go! It's an incredible value - you get so many patterns for the price of one. In this special issue, it's all about kids! From babies to tweens there are fun, hip play clothes, special party outfits, beachwear, and some sweet crafts. Burda is all about modern and classic. You won't find fussy frills here, just funky modern casual and fresh gorgeous dressy looks. Stop by and see more of this issue and all of the current Burda Style magazines at Treadle! Check out these fun new summer cotton prints. Popsicles, lobsters, and sunglasses evoke a day at the beach. Perfect for simple, fun skirts, kids' clothes, or crafts like tote bags. Our summer class schedule is now available! Check out www.treadleyardgoods.com/classes to see all the options! From our basic sewing series to kids classes and lots of fun new stuff, there is something for everyone. Reserve your space early because classes fill up fast! To register, call us at 651.698.9690 or just stop by the store! We have even more delightful new rayon prints in the store. Soft, fine, and swishy, these rayon prints are fun and flattering. Whip up a simple dress, blouse, or skirt in one of these and you'll know you look amazing. Spring is here, and that means Summer is right around the corner! As the weather warms up, get going on your summer sewing with fresh new fabrics. Today let's take a look at a selection of seersucker. Stop by and see what's new for Spring and Summer at Treadle!